Do you have trouble falling asleep? Trouble staying asleep? As we get older, it becomes a little harder to fall asleep and stay asleep. But although our sleep patterns change, our need for sleep doesn’t. Just like diet and exercise, a good night’s sleep is essential for your good health, for keeping you alert and energetic, and for building your body’s defenses against infection, chronic illness, and even heart disease. 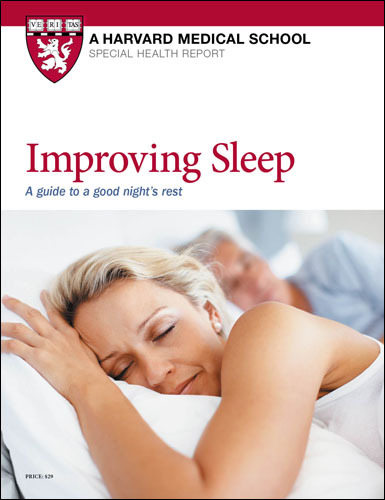 Improving Sleep is an instructive and fact-filled report from Harvard Medical School that explains why sleep often eludes us as adults. You’ll read about those habits and conditions that rob us of peaceful slumber. And most importantly, you’ll learn what you can do to again enjoy the satisfaction of a restful night’s sleep. You learn not only what triggers insomnia but also how new techniques and therapies are helping men and women get to sleep more quickly — without the use of medications. You’ll read about the benefits of “strategic naps.” You’ll discover how to make your sleep surroundings more conducive to rest. And you’ll be told about seven things you should do — and not do — before going to bed. Do you or your spouse snore? There are hundreds of devices marketed as aids to stop snoring. But do any work? The report will sort them out and will brief you on new procedures that are restoring quiet to the bedroom. Have you ever been screened for sleep apnea? The report gives you a six-question test that will help you determine if you need to be tested for this life-threatening condition. Plus, you may want to speak to your physician after you read about those medications that can cause insomnia, drowsiness or even nightmares. And the report will share news about advances in controlling such sleep-troublers as heartburn, arthritis, nocturia, and restless legs syndrome. A growing number of studies have linked long-term sleep deficits with significant health problems. Diabetes. 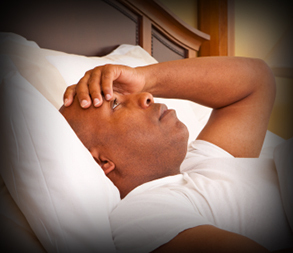 A report in Diabetes Care found a sharp increase in the risk of type 2 diabetes in people with persistent insomnia. People who had insomnia for a year or longer and who slept less than five hours per night had three times the risk of type 2 diabe­tes compared with those who had no sleep com­plaints and who slept six or more hours nightly. As with overweight and obesity (which are also closely linked to type 2 diabetes), the underlying cause is thought to involve a disruption of the body’s normal hormonal regulation, but in this case, it results from insufficient sleep. High blood pressure. Researchers involved in the diabetes study also evaluated risk of high blood pres­sure among the same group of people, which included more than 1,700 randomly chosen men and women from rural Pennsylvania. As described in the journal Sleep, the researchers found the risk of high blood pressure was three-and-a-half times greater among insomniacs who routinely slept less than six hours per night compared with normal sleepers who slept six or more hours nightly. Heart disease. A number of studies have linked sleep deprivation with several well-known risk factors for heart disease, including higher cholesterol levels, higher triglyceride levels, and higher blood pressure. People who don’t get sufficient sleep also have higher blood levels of stress hormones and substances that indicate inflammation, a key player in cardiovascu­lar disease. Some research suggests that chronic sleep deprivation (getting no more than four hours a night) may double a woman’s risk of dying of heart disease. One common cause of poor sleep, sleep apnea (see page 31) also raises heart disease risk. The low oxygen and high carbon dioxide levels that occur in apnea-disturbed sleep raise levels of stress hormones. This boosts blood pressure and heart rate, putting stress on the cardiovascular system. Sleep apnea appears to increase the risk of heart attack, heart failure, and heart rhythm disorders such as atrial fibrillation. Peo­ple with moderate to severe sleep apnea have three times the risk of stroke compared with people who don’t have the condition. In the Wisconsin Sleep Cohort study, people with severe sleep apnea were three times more likely to die of heart disease during 18 years of follow-up than those without apnea. When researchers excluded those who used a breathing machine (a common apnea treatment), the risk jumped to more than five times higher. Apnea spells can trigger arrhythmias (irregular heartbeats), and the condition also increases the risk of stroke and heart failure. Mental illness. A study of about 1,000 adults ages 21 to 30 found that, compared with normal sleep­ers, those who reported a history of insomnia dur­ing an interview were four times as likely to develop major depression by the time of a second interview three years later. And two studies in young people— one involving 300 pairs of young twins, and another including about 1,000 teenagers—found that sleep problems often developed before a diagnosis of major depression and (to a lesser extent) anxiety. Sleep prob­lems in the teenagers preceded depression 69% of the time and anxiety disorders 27% of the time. Dementia. A growing body of research suggests that sleep disturbances may increase the risk of devel­oping Alzheimer’s disease. A report that pooled find­ings from 27 observational studies found that people with sleep problems were nearly 1.7 times as likely to develop cognitive impairments or Alzheimer’s than people without sleep issues. Experts believe that sleep helps clear the brain of amyloid, the protein thought to damage nerve cells in Alzheimer’s. A 2018 study in JAMA Neurology found that older people with exces­sive daytime sleepiness were more likely to show increased amyloid in their brains over time. However, it’s not yet clear whether disrupted sleep contributes to amyloid buildup or vice versa. Viral infections. Anecdotal evidence supports the notion that when you’re tired and run-down, you’re more likely to get sick. A study in Archives of Inter­nal Medicine offers some proof. Researchers tracked the sleep habits of 153 men and women for two weeks, then quarantined them for five days and exposed them to cold viruses. People who slept an average of less than seven hours per night were three times as likely to get sick as those who averaged at least eight hours. Weight gain. Not getting enough sleep makes you more likely to gain weight, according to a review article in the journal Obesity that analyzed findings from 36 studies. The link appears to be especially strong among children. Lack of sufficient sleep tends to disrupt hormones that control hunger and appe­tite, causing you to eat hundreds of extra calories per day—in particular, quickly digested carbohydrates. What’s more, the resulting daytime fatigue often dis­courages you from exercising. Excess weight, in turn, increases the risk of a number of health problems— including some of those listed above.